The movie theaters in Maryland, in the suburbs of Washington, DC offer a wide range of cinematic entertainment. From large multi-screen stadium-style theaters to small intimate independent cinemas, the capital region covers every type of experience. See the following guide to find out unique features of each destination, what's playing, get showtimes and purchase tickets. The theaters are arranged geographically by city or town. Bow Tie Annapolis Mall 11: Annapolis Mall, 1020 Annapolis Mall Rd Annapolis, MD 410-224-1145. Stadium-style seating and 11 screens. Bow Tie Harbour 9: Annapolis Harbour Center, 2474 Solomons Island Rd Annapolis, MD 410-224-1145. Nine theaters. AMC Loews Centerpark 8: 4001 Powder Mill Road Beltsville, MD 301-937-9493. Reserved seating available. ArcLight Cinemas: Westfield Montgomery (Montgomery Mall) 7101 Democracy Boulevard Bethesda, MD (301) 469 6025. Note, the theater uses a reserved seating system with stadium-style seating. There is an upscale cafe on-site. Landmark's Bethesda Row Cinema: 7235 Woodmont Ave. Bethesda, MD 301-652-7273. The 8-screen cinema focuses on independent films. IPIC Pike & Rose: 11830 Grand Park Ave, North Bethesda, MD (301) 231-2300. Upscale cinema chain with plush seating, gourmet light bites & cocktails, plus in-theater service. Regal Bowie Stadium 14: 15200 Major Lansdale Blvd. Bowie, MD 301-262-9133. Stadium-style, 14 screens, cafe on-site. Xscape 14 Theatres: 7710 Matapeake Business Dr. Brandywine, MD 301- 909-7654. Reclining seats, 14 screens, premium amenities. AMC Columbia 14: 10300 Patuxent Parkway Columbia, MD 410-423-0520. IMAX available, 14 screens. United Artists Snowden Square 14: 9161 Commerce Center Drive Columbia, MD 410-872-0670. Reserved seating available, stadium seating, 14 screens. Regal Westview Movies 16: 5243 Buckeystown Pike Frederick, MD (301)620-4081. Reserved seating available, stadium seating, 16 screens. AMC Loews Rio Cinemas 18: 9811 Washingtonian Center Gaithersburg, MD 301-948-6673. Stadium seating, 18 screens on two levels. Regal Cinemas Waugh Chapel Stadium 12: 1419 S Main Chapel Way Gambrills, MD (410) 451-7160. Reserved seating available, stadium seating, 12 screens. Regal Germantown Stadium 14: 20000 Century Blvd. Germantown, MD 301-916-9235. Stadium seating, 14 screens. Greenbelt Academy 8 Theaters: 6198 Greenbelt Road Greenbelt, MD 703-998-4262. Eight screens. Cinemark Egyptian 24: 7000 Arundel Mills Circle Hanover, MD 443-755-8992. Reserved seating available, stadium seating, 24 screens. AMC Magic Johnson Capital Center 12: 800 Shoppers Way Largo, MD 301-336-2871. IMAX, Cafe on site, stadium seating, 12 screens. Regal Rockville Town Center 13: 199 E Montgomery Ave Rockville, MD 301-340-9432. Reserved stadium seating available, 13 screens. 301-495-6720. The education and cultural center features independent movies, foreign films, documentaries and classic cinema on two screens. The organization also hosts frequent film festivals. 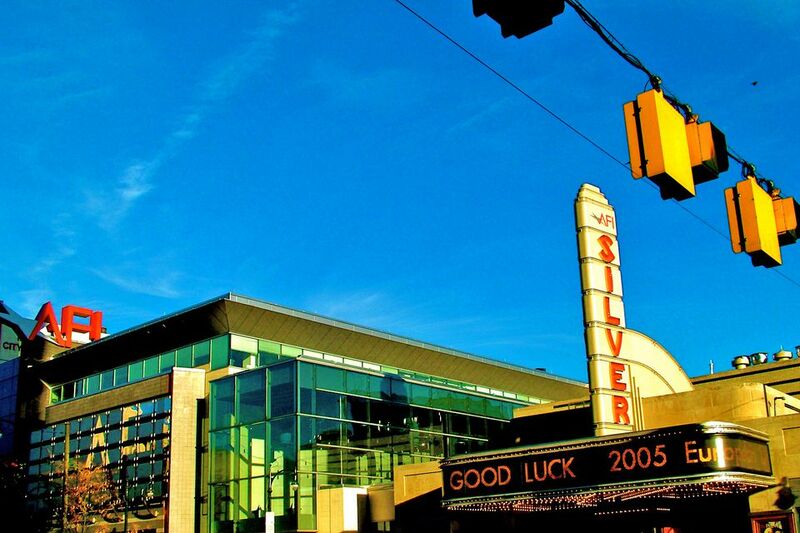 Cinemas Majestic Stadium 20: 900 Ellsworth Drive Silver Spring, MD 301-681-2266. Reserved seating available, stadium seating, IMAX, 20 screens, cafe on-site. Phoenix Big Cinemas Marlow 6: 3899 Branch Ave. Temple Hills, MD 301-702-2829. Six screens. AMC Loews St. Charles Towne Center 9: 11115 Mall Circle Waldorf, MD 301-870-6058. Reserve seating available, 9 screens.